KCET Second Round Seat Allotment Results 2018 For Engineering, B.Pharma/ D.Pharma Architecture, Farm Sciences: Karnataka Examination Authority (KEA) has scheduled the 2nd seat allotment result displayed on 11th august. Candidates those who are waiting for KCET 2nd seat allotment result can check from the KEA Official website, kea.kar.nic.in. aspirants can check the seat allotment list (real) and can alter the choices. The KEA will screen the possibilities and releases the KCET Second seat allotment result on 29th July. Candidates who got allotted admission in the KCET seat allotment will have to report at the allotted colleges by paying the requisite admission fee. 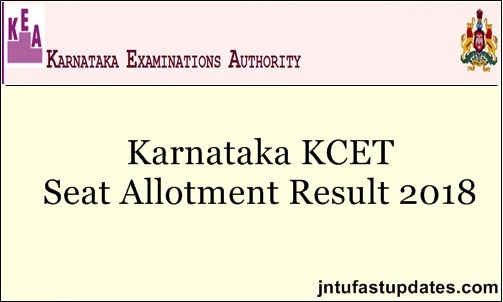 Check more details of KCET real seat allotment result 2018 from the following article. Karnataka Common Entrance Test is annually being organized by the KEA to provide admission to students into various courses appears for the KCET examination. The KEA has recently finished the application process of Karnataka CET. Karnataka Common Entrance Test (KCET) is an eligible test which is conducting by the organization, mainly for providing admissions into various under graduation courses in top colleges and universities. KCET Courses includes Engineering, Architecture, and Medical, etc., Yearly, many of the Intermediate/12th class students seeking admission in Graduate Degree courses in the state of Karnataka appear for the KCET examination. This year the KEA has conducted the KCET examination on 18th and 19th April in many examination centers across the state. Lakhs of aspirants seeking admission in various Graduate Degree courses have appeared for the test. Candidates have also checked the Karnataka CET results. The KEA has displayed the seat matrix and fee structure of various courses on 11th July. Candidates qualified in the KCET examination have checked the details and proceeded for optional entry process from 11th July to 15th July. KEA is set to release the 2nd seat allotment result today, 29th July. Candidates can go through the result and alter/lock their choices. The KEA will release the KCET allotment result on 29th July after 6PM. How To Download KCET 2nd Seat allotment results 2018? KCET Seat Allotment result link will appear on the homepage. Click on the link and provide the necessary details like login credentials. The KCET Seat allotment list (2nd round) will be displayed on the screen. Check the list and take a printout for further reference. Will there be any provision of option entry (again) for the 3rd round(engineering). If so when will it be? Sir extended seat allotment result time? Sir , I got agri seat in one of the agri college , so now I want to change this college by doing option entry in farm science extended round, is it any problem sir?? on 3rd August . 3rd round option entry is their….on 6:00pm..
First round or second round???? What is the date for 3 rd Round option entry?